Which part of zinnia to pinch or cut? 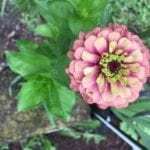 My zinnias are growing beautiful but flower blooms are very slow. A lot of leaves. I wouldn't pinch anything back at this point as your trying to get them blooming. After they are blooming you can take off cut flowers and dead head to promote more flowering and a bushy plant if you prefer. Lots of lush green and few flowers generally indicates to much Nitrogen in the soil. It's likely needing Phosphorous. You can use Bone Meal to help with this.